Keep Toddler Shoes Looking Clean And New. Toddler shoes are usually not the cheapest part of your toddler’s wardrobe. Without care, though, they can easily receive the most wear. How can you keep your toddler’s shoes in prime condition throughout their months of use? It’s easier than you think. Here is your toddler shoes reference, also known as every mother’s guide to super-clean, super-nice shoes for tots everyday! 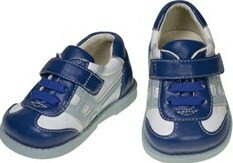 Look at the tag or insert in your toddlers shoes to find out what kind they are and what treatment they’ll need. Your toddler probably doesn’t wear leather everyday, but he may have a pair for when you want him to look all dressed up. To keep your toddler’s leather shoes nice you want to keep them as far away from water as possible—which means they should never go in the washing machine. Only wash them in water (i.e., bathroom sink) if it’s absolutely necessary—for instance, think potty training accident. For the rest, just wipe them down with a baby wipe or damp cloth. Polishing with shoe polish will extend the life of your toddler’s leather shoes and also make any scuff marks or scratches disappear. Suede or Nubuck shoes are leather shoes with a soft, napped finish. These shoes can’t be polished, but you can clean them with a special suede eraser. Erase dirt and marks in the same way you’d erase a pencil mistake in your notebook: rub back and forth until the spot disappears. New Suede or Nubuck shoes can be sprayed with a nontoxic, waterproof protectant. Some toddler fabric shoes are not meant to be machine washed; these, you need to clean by a hand with a wet wipe or damp cloth. If they get really dirty, you can scrub them in the bathroom sink with soap and water and a bristle brush. But the best way to extend the life of your toddler’s fabric shoes is to spray them--- when they’re brand new and squeaky clean—with waterproof, non-toxic shoe protectant. This will form a thin film over the top of the shoes, a film that keeps dirt from sinking in. It’ll also make the shoes very easy to wipe clean. If your toddler’s shoes are machine washable you have it easy: when they’re ready for a wash, all you need to do is throw them in the washing machine! Be aware, though, that every trip through the washing machine will eat up just a little more of the shoes’ life, so space your machine washings out as much as possible. In between, clean up dirt, mud, or other marks with a baby wipe or a clean wet cloth. Make sure you always air dry shoes—they may come beautifully out of the washer, but the heat in your clothes dryer can ruin them. There you have it--- your quick guide to cleaning your shoes at home. No reason to let your toddler run outside looking scruffy—his shoes can stay new-looking right up to the day he outgrows them.